Summer ramen! Fresh noodles, vegetables and a light ponzu sauce. It’s as refreshing as it sounds. I’ve been on a cooking spree lately, which I assume correlates to the fact that I am back home after a busy travel schedule. Don’t get me wrong, I love visiting friends/family and getting to see new places, but I’m a homebody at heart. I relish lazy weekends where we don’t have much on the agenda except being with each other and eating good food. I originally posted this recipe last year but I made it again this weekend and it was so good that I wanted to reshare it again. 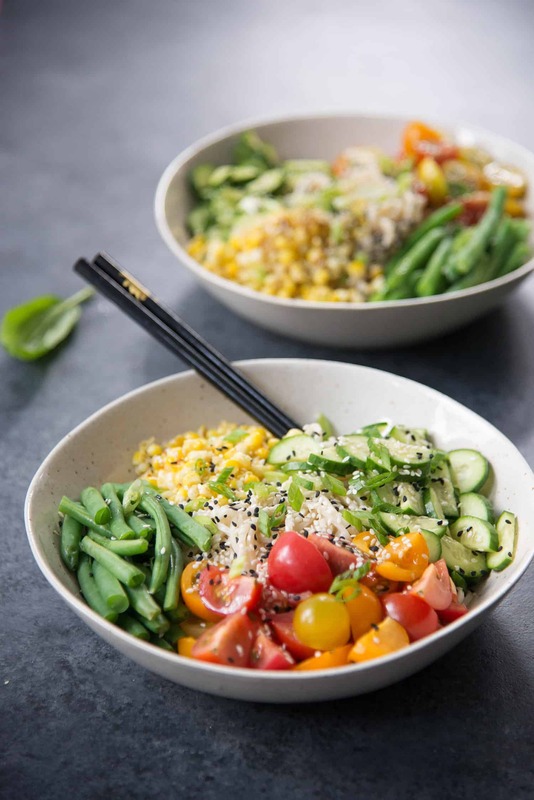 If you like salad and you like ramen, then you will love this simple, plant-based dinner. Ramen noodles will always remind me of middle school, of days when I would come home from school and cook an entire packet of ramen noodles to enjoy while doing my homework/reading Teen People magazines. I think my family had just discovered the beauty of $0.25 packs of noodles and we happily downed bowl after bowl of the good stuff. My flavor of choice was creamy chicken with added frozen peas; I opted to drain most of the broth out after cooking so I could slurp the noodles without making a mess. To this day, I can’t look at a package of ramen noodles without instantly thinking about that time and the 5,988 bowls of ramen that I ate during those years. Well, this ramen is none of that. It’s a cross between a ramen salad, a ramen noodle bowl and a DK creation. 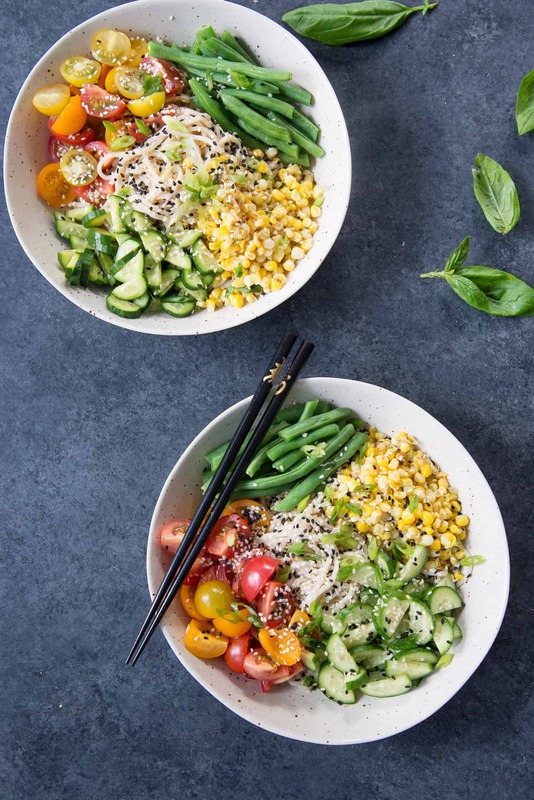 Fresh ramen noodles (10x much better than the dried kind) are tossed in a light ponzu sauce, then served with heirloom tomatoes, cucumber, blanched green beans and corn. Plus more sauce and sesame seeds for texture and crunch. Super delicious and dare I say, refreshing? It’s ramen for 100 degree days. To make prep work super easy, I use steamable fresh green beans that I find at Trader Joe’s (though I think most grocery stores carry them in the produce aisle). Yes, I know cooking vegetables in plastic in the microwave probably isn’t the greatest, but they are done in less than 4 minutes without me needing to get any other pots or pans out. If you prefer to steam the beans on the stove, that works too. I might suggest using the same pot that you cook the ramen noodles in. Simply place a steamer basket over the hot water and let cook until just tender. 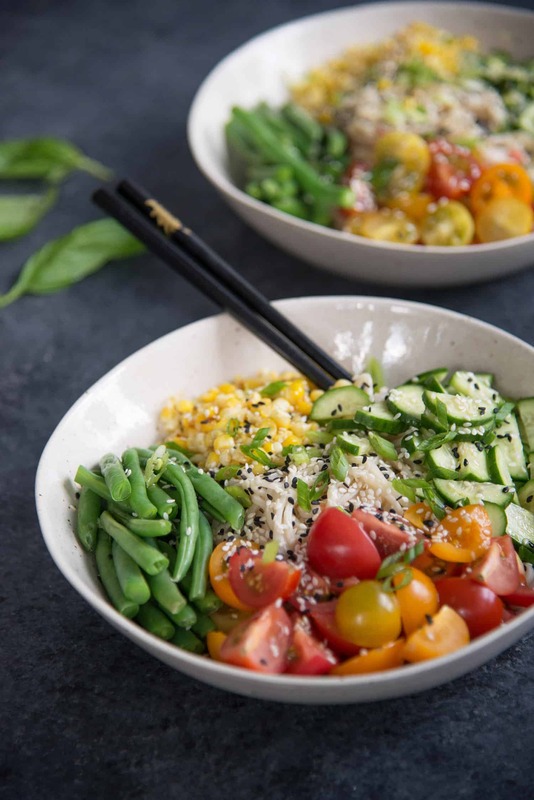 The green beans should still have a bite to them; you want that texture to contrast with the juicy tomatoes, sweet corn and tender noodles. 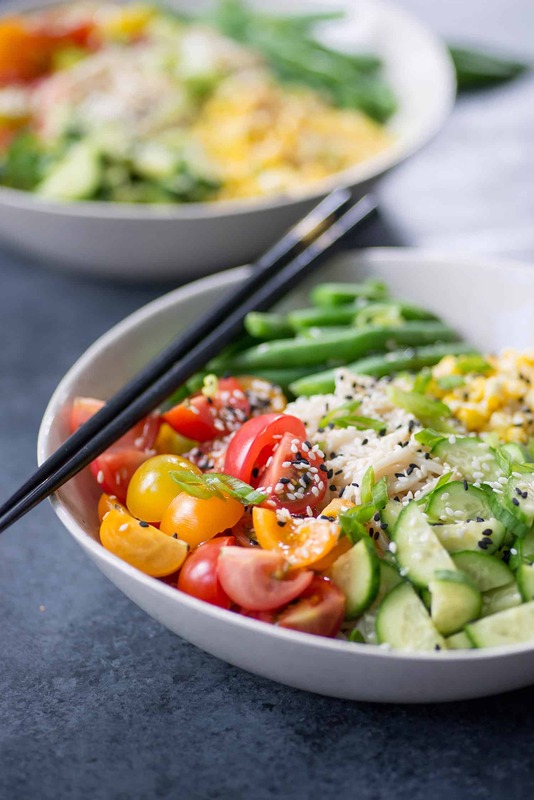 Summer Ramen Noodle Salad! 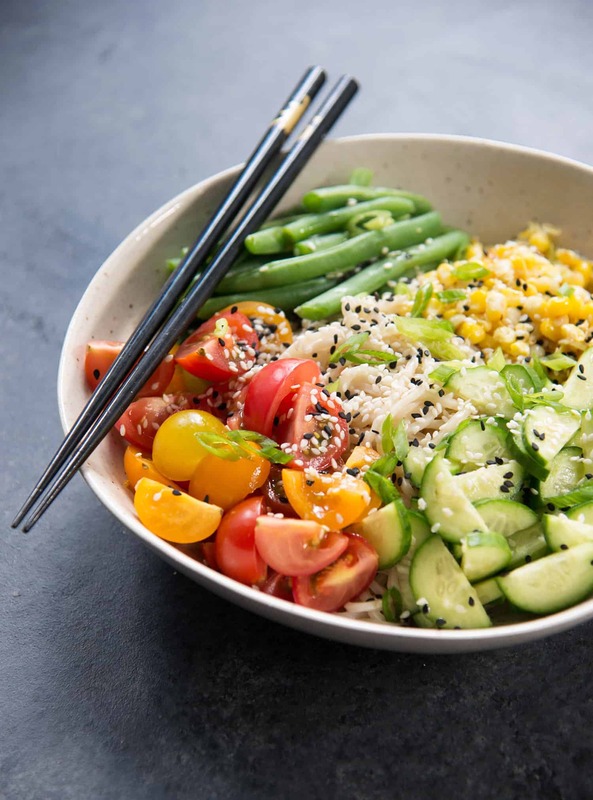 You’ve gotta try this vegan salad filled with ramen noodles, green beans, tomatoes, cucumbers, corn and a ponzu sauce. Bring a large pot of water to a boil. Add the ramen and cook according to package directions. Drain and rinse with cold water; set aside. While the noodles are cooking, steam the green beans. I buy the fresh green beans from Trader Joe’s that can steam in the microwave. Alternatively, steam on the stove or in a microwave. Set aside. Heat the olive oil in a medium skillet over medium heat. Add the fresh corn kernels, ginger and scallions. Cook until corn is just softened, then set aside. Whisk together the ponzu, rice wine vinegar and sesame oil. Toss noodles with 1/2 of the sauce and divide among 4 bowls. Top with green beans, cooked corn, cucumbers and tomatoes. Drizzle with remaining sauce and garnish with sesame seeds and scallions. I use fresh ramen noodles for this as I think they taste best, but most brands contain egg. For the vegan version, if you can’t find fresh egg-free noodles, then substitute dried. 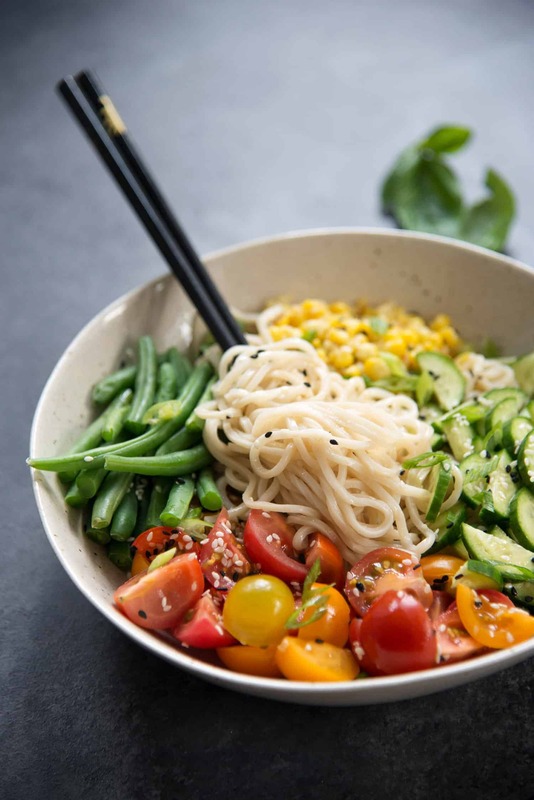 this looks delish, what brand of fresh noodles do you use, or where do you buy them at? I usually shop at spouts and i rarely see fresh noodles but maybe i’m not looking in the right place? Hi Diana- I don’t have a Sprouts near me so I’m not sure of the exact location but check near the tofu section- that’s where I typically find mine. They should be near fresh wonton wrappers and other asian noodles. While I love the taste of fresh noodles, it’s OK to substitute in dry noodles instead.